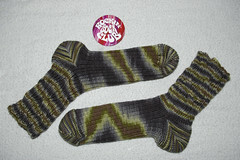 Finished STR Rockin' Sock Club Inside Out! When doing the provisional cast-on, do the crochet chain onto the needle. I find that MUCH easier than trying to pick up the crochet chain after it has been completed. See Knitting at Knoon for a description and video of this technique. For some reason I found this weird - but it worked. You will knit 32 stitches, turn and knit 31 stitches and wrap that last stitch. That last stitch will just hang out until you finish the short row toe, it also is the stitch that your tail is attached to. You then knit 30 stitches, wrap that last stitch (do not knit it) and turn. At this point there will be two wrapped stitches. Continue with the pattern. All this time you will be knitting flat, but will be making a little cup. I personally like to use double pointed needles, so I oriented the stitches so that the sole was on 2 needles, and the instep was on 2 needles. If you do magic loop or use 2 circular needles, do the same thing make one side the sole, the other the instep. The advantage is that when you get into the foot ribbing it is really easy to see if you did the setup correctly as you will start the instep with a purl stitch, and start the sole with a purl stitch. Also this makes the heel easier to orient. Short row heel. I had to do this twice on the first sock - the first time I just left the instep on the 2 double pointed needles. It just about drove me crazy. Once I started the cuff I realized that the foot was too long, so a frogging I went. The second time, I put the waiting instep stitches on a circular needle and then did the short row heel. MUCH better. You could also put the instep stitches on a piece of yarn so that they don't get in the way. Cuff. The cuff pattern is repeated three times. To avoid using markers I just knitted the cuff using 3 double pointed needles. This would be where using double pointed needles is to your advantage. Fit. I tend to walk out of the foot of my socks, so I knitted VERY tightly using size 0 needles for the foot. On the cuff, you will want it to be knit much looser, this is due to the cabling and it really pulls in and remove a lot of the stretch you get with the ribbing. So I knit this using size 1 (2.5mm) double pointed needles. If this is not knit loosely, you will have MUCH trouble getting your foot through the cuff. I have a very wide (size D US width) "peasant foot", in size 7. So your mileage may vary. I joined the Blue Moon Fiber Arts Rockin' Sock Club this year. Not only is it the first time I have *ever* been in a sock club, but it is the first time I have knitted with Socks That Rock. From this perspective - let me say that this yarn is gorgeous and the pattern interesting. Heck I have never done a toe up sock before this as well. PS - I used size 0 for the foot and size 1 for the cuff, looks like I hit the sweet spot in the cuff as you can see by the really nice striping. So, over the summer I bought one of those fancy pants "French Door" styled refrigerators, basically because the one I had was more of a cabinet then a cooling device. Once it was installed Tom noticed that they used two 60W appliance bulbs in it. Now this was just after changing out just about every light bulb in my home for Compact Fluorescent bulbs, so we were a bit sensitive to the use of incandescent bulbs. If you do the math - I had the equivalent of an EZ-Bake Oven in my fridge. Heck an EZ-Bake Oven only used one 100W bulb so - I had an extra 20W MORE heat than that little oven - in my fridge. I opened the fridge and the plastic diffuser over the light bulbs had MELTED. I had melted plastic IN MY FRIDGE! This is not right. Since CF Bulbs really don't do well in cold quick turn-on environments - the other option was LED's. I have now replaced the 60W bulbs with 3W LED bulbs (from Super Bright LEDs very fast shipping, also reasonably priced). The light is much dimmer but who needs the equivalent of the sun in their fridge just to see if you are out of milk?